I hated school from 2nd grade through college. It was painfully boring for me. I loved summer camp. I went to day camp for 10 years. I have vivid memories of my camp experiences. I have vague, blurred memories of school. I feel that I learned so much more at camp than I did at school. I believe that school wasted and basically stole my time. So needless to say, I promote the idea that school should be more like camp. 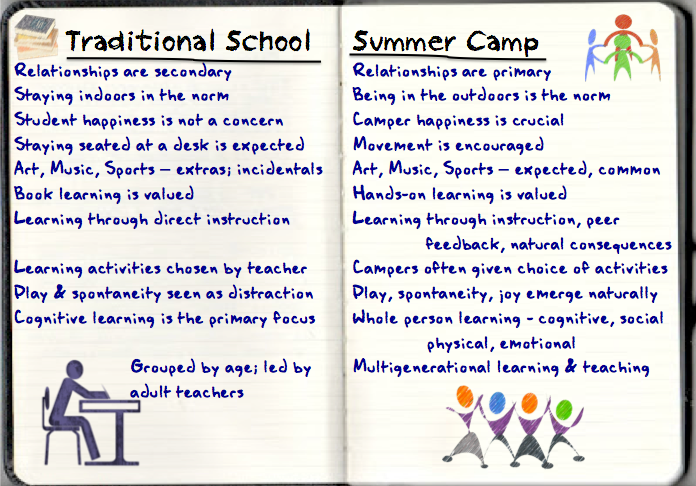 What follows is a chart comparing school to camp. Which would you prefer to attend? Which would you prefer your own children to experience? What follows are some excerpts of articles that reinforce these ideas.